In many ways the goal of preaching is this relationship, the listener and God. 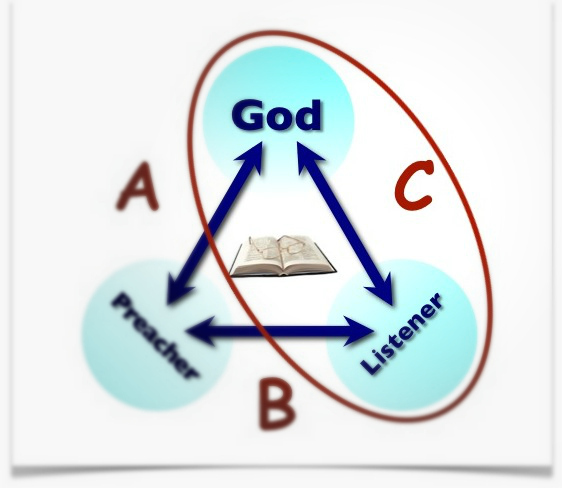 We’ve already considered God and the Preacher, the Preacher and the Listener, but now for the third relationship. As ever, dangers and potential. 1. There is a danger that the listeners connect with the preacher, but not with God, due to the effectiveness of communication that inherently lacks the richness of biblical content. 3. There is a danger that God’s personal care and concern and self-revelation not get through the preacher to the listeners. 4. There is a danger that the God presented by the preacher may motivate distance rather than intimacy and thereby hinder true connection. 5. There is a danger that the preacher’s goal be an equipped and informed listener who can then become a “self-made” or “self-starting” Christian (beware of application not built on response to and relationship with God). First, can there be a greater thrill than to see others growing into a deeply forged relational responsiveness to a loving God? Does it get any better than seeing others flourish spiritually as they discover the fullness of life offered in the New Covenant where they can actually know God personally? Second, when people have a genuine relationship growing with God, then it will mean an increase in outward spilling and spreading goodness. Why should that not result in blessing for the preacher? While we don’t preach for that benefit, it would make sense in a community of captivated Christians, for preaching to forge a community of mutual delight – God in them and them in God and both in the preacher, etc. Sadly the relationship between preacher and listeners is too often fraught with the tensions of world-like political power struggles and distrust, but what if the gospel really gripped a church, surely it would be different? Furthermore, that outward spilling goodness would also mean mutual body life as listeners naturally minister by giving of themselves to each other. It doesn’t end there, the spill of grace would then surely also reach outward again to the community (and that without the preacher pressuring people to be witnesses!) That’s the thing about God’s relational bond, it doesn’t end there, it just keeps on spilling outward!